Ahead of the 2014 Football World Cup in Brazil in June, the government has tried to convince Brazilians that hosting such events are a massive boost to the economy. The Brazilian Tourism Ministry forecasts that the 2014 soccer World Cup will generate around 62.1 billion reais (or $27.7 billion) in revenues, three times what was injected into the country’s economy during last year’s Confederations Cup tourney. The Ministry released data on Monday showing that the 2013 Confederations Cup boosted Brazil’s gross domestic product (GDP) by 9.7 billion reals ($4.37 billion). According to a report compiled by the Foundation Institute for Economic Research (FIPE) and released by the ministry on its website, 58 per cent of the total revenue remained in the host cities and 42 per cent was distributed to the rest of the country. “The outcome shows that the impact of the tournament is not limited to the places where the games take place, it has an impact on all of Brazil,” said Tourism Minister Vinicius Lages. The event also created 303,000 jobs, 60 per cent of them in the host cities, and the remaining 40 per cent in the rest of the country, claims the report. 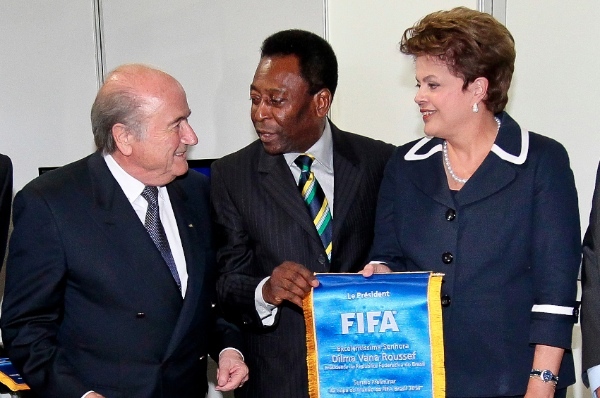 The Rousseff administration now hopes that the 2014 World Cup of soccer, which Brazil will host from June 12 to July 13, will generate about three times that amount. Anti-government protests had broken out during last year’s Confederations Cup, with thousands of protestors demanding better public services while criticizing massive public spending on sporting events. More than 600,000 visitors are expected to arrive for the World Cup in Brazil, with games being played in 12 cities. The Brazilian Air Force will declare no-fly zones over World Cup stadiums to prevent terrorist attacks during this year’s soccer tournament. Preparations for the global sporting event have been slow while seven workers have died building Brazil’s World Cup stadiums. Several past global tournaments have, however, all been troubled by fears of disruptions– Tibetan protests before the Beijing Olympics in 2008, crime fears before the South African World Cup in 2010, security concerns before the Winter Olympics in Sochi in Russia in 2014.